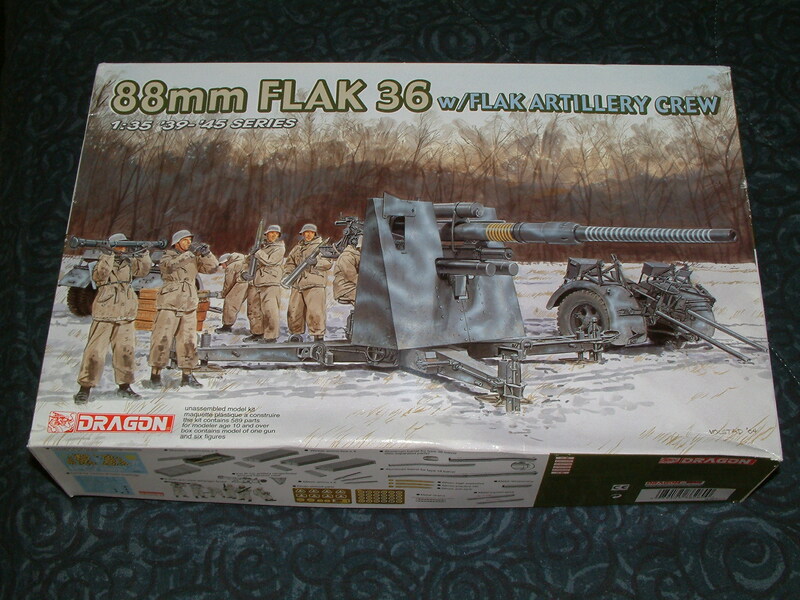 DML Flak 88 1/35 -act 2. 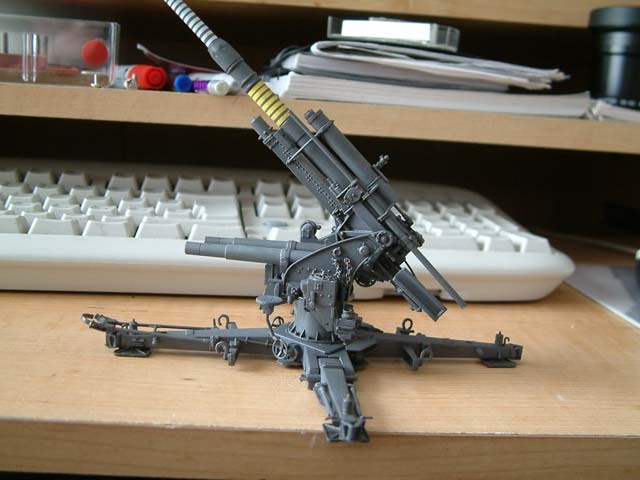 With this kit I wanted to depict the gun in a very different position than my first build. 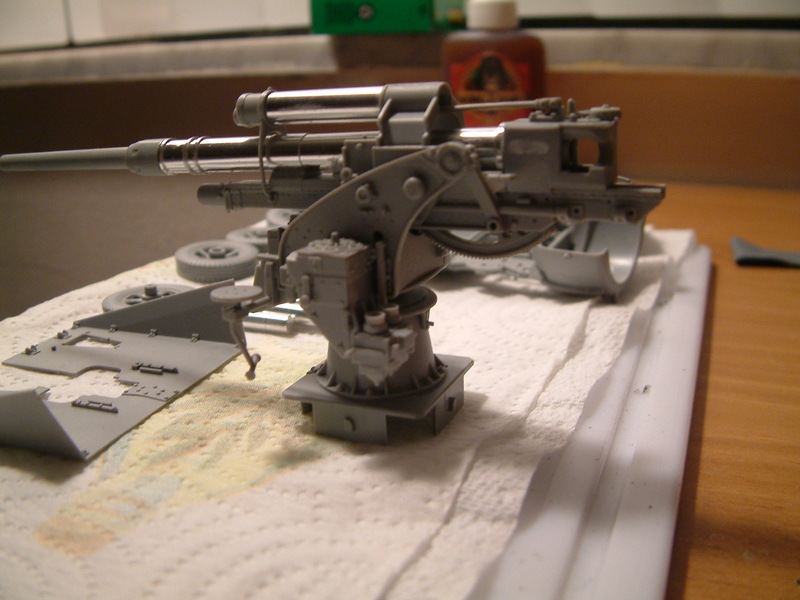 Whereas the first model was build showcasing the gun in a deployed state, with the gun shields attached, and in a German grey paint scheme, the new build was going to be an Afrika Korps gun without shield, still in transport mode (in which state the gun could still be fired I might add). The build was unremarkable. 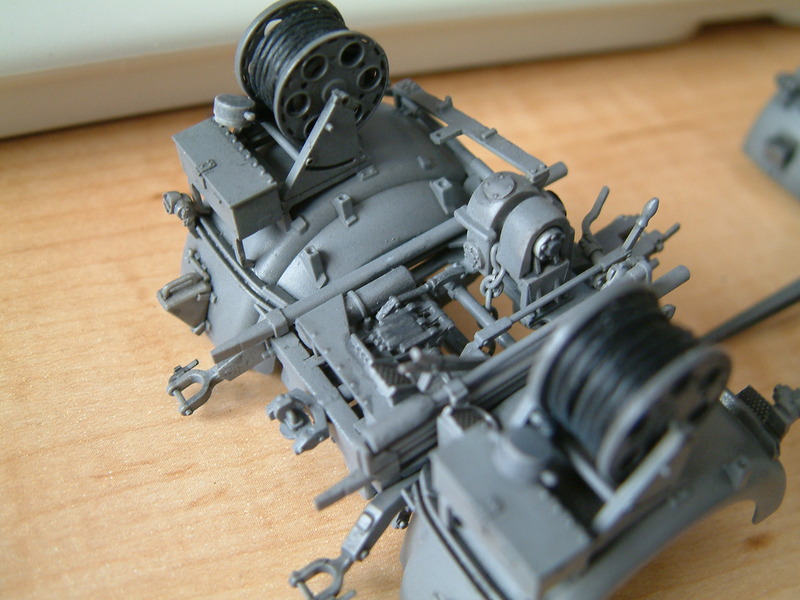 It’s a very complex model, but it’s still relatively easy to build. The detail and the inclusion of extras simply make you feel like you’re working with the supercar version of scale models. Luxury in a box. Limbering up… the model is fully functioning in this respect as well -although you’d have to be careful about the delicate plastic parts. The running gear had to be assembled, painted and weathered before finishing the hull. All the lenses and periscopes were masked, the tracks covered with tape, and on with the green paint. The hatches, grab handles, and other protruding parts were highlighted with a lighter version of the same green color. (The contrast has been decreased by the subsequent filters later.) At this stage I added the decals, as I wanted them to “blend in” with the weathering steps. Dullcote was used to fix the decals, and after a day of waiting (to make sure the lacquer coat sets properly), I carried on with filters. Two layers of yellowish filters, and some streaking later the model looked quite close to finishing… I thought. I’ve always found it ironic to work on an even, smooth paintjob, and then spend the rest of the weathering to make it uneven… but this is what we do I guess. After the filters I’ve used a burnt umber and black oil mixture to create very light streaks; I’ve repeated this process about three times, making sure the different hatches, etc are streaked differently than the background. I’ve used the same color for some light pin washes. And then came the dirt. The next couple of layers on the side skirts were some darker brown pigments, and some black at the exhaust. I’ve carefully added them using a brush; what sticks, sticks – this way you can build up the effect in a controlled manner. The last step was to add a couple of leaves to the splashguard in front; these come from some tree in the backyard (shamefully as a biologist I have no clue about plants). The dried seed-pod falls apart into seeds and these little leaf-like structures, which look like maple leaves. And that’s it -here’s a real-life laser tank, courtesy of the Soviet Union. It took quite a lot of time to collect enough reference photos on the interior; and I’ve found out some interesting things about this monster. 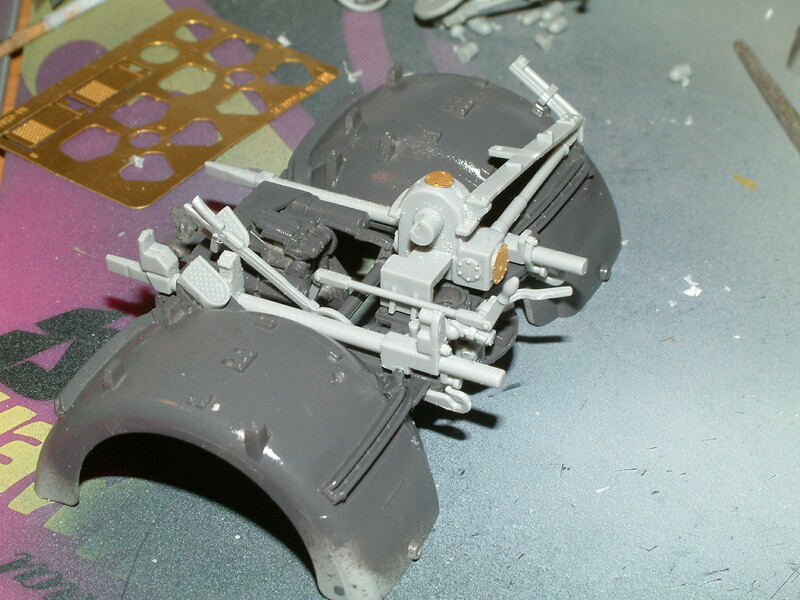 For example the whole superstructure is fixed to the hull only with those gigantic rivets on the side of the vehicle. If you ondo them, you can just lift the top off. First I glued the resin Zimmerit to the hull; it went on much easier than expected. I only had to cut out the appropriate shapes, and use two-part epoxy to affix them to the model. It was simple as that; just make sure you don’t leave any bubbles when you place them onto the plastic surface. Any mistakes can be corrected using putty. 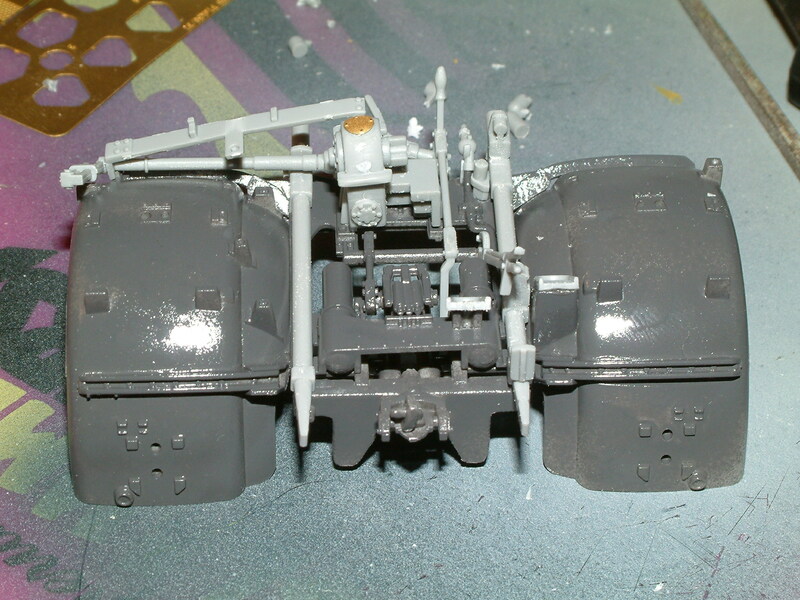 Anyhow; the interior was quite a big challenge for me at that stage of my model building life, but it started me down on a ruinous path: tanks with full interiors. 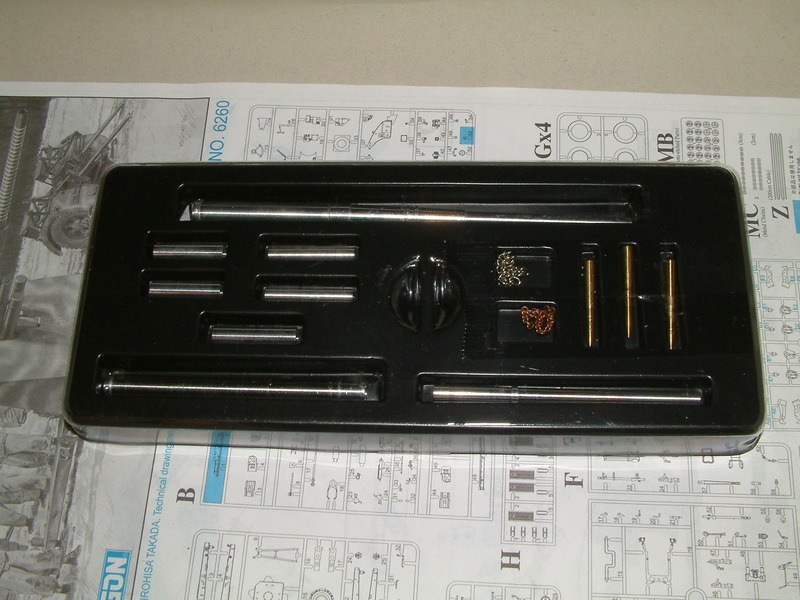 The transmission was a resin aftermarket item; since the Eudard PE set offered a really nice, PE replacement for it, the end part had to be removed. 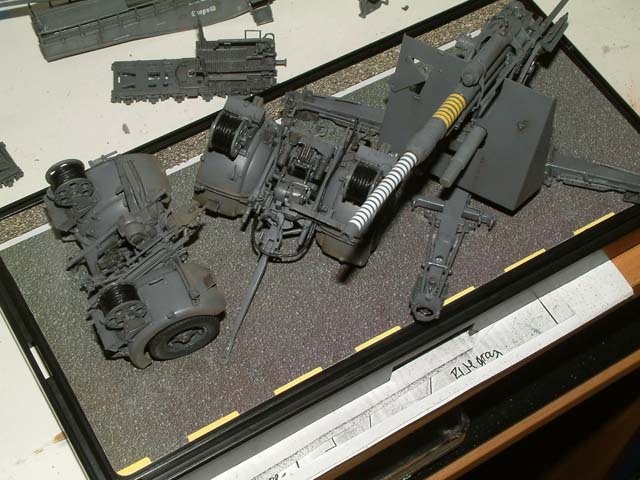 The interior was dressed up using the Eudard set: the floor was improved considerably using the no-slip surfaces, the railings on the superstructure were added (as they were completely missing from the Tamiya kit), straps, radios, etc were added. All in all, they really improve the look of the interior. The painting was done using airbrush: the lower hull was given a primer red color, while the rest of the interior the typical German cream interior color. I’ve put the plastic ones where they were least visible, and the metal ones into the foreground. I made sure that the rocket placed onto the loading rack has the fuse fitted. The superstructure was also a very interesting, very busy affair. There were a lot of extra parts added to make it look realistic. Once everything was finished (and very slightly weathered) I masked the openings with tape, and glued everything in place. I’ve decided on light weathering after looking at the photos taken by the US Army: the captured Sturmtigers were also spotlessly clean. They simply had no time to get worn down before being taken by the Americans. 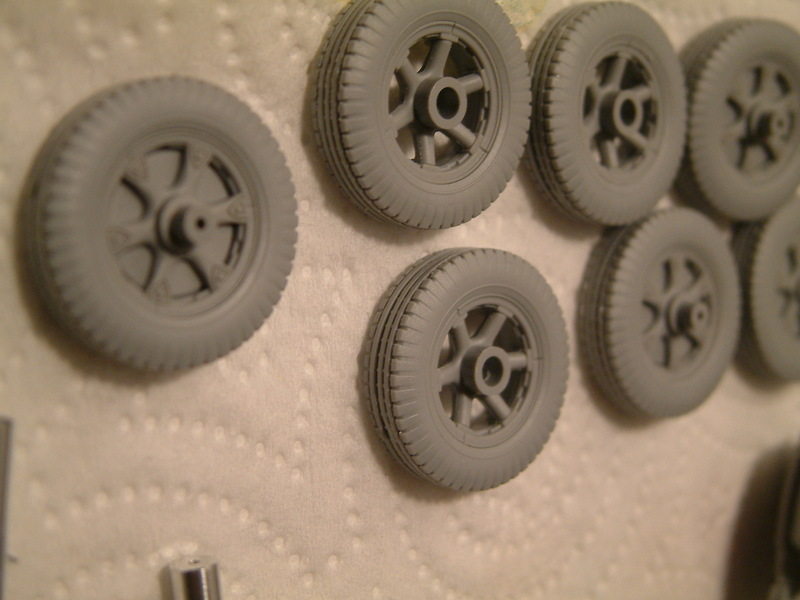 The roadwheels were steel rimmed; it was easier to paint them than the rubber rimmed varieties. 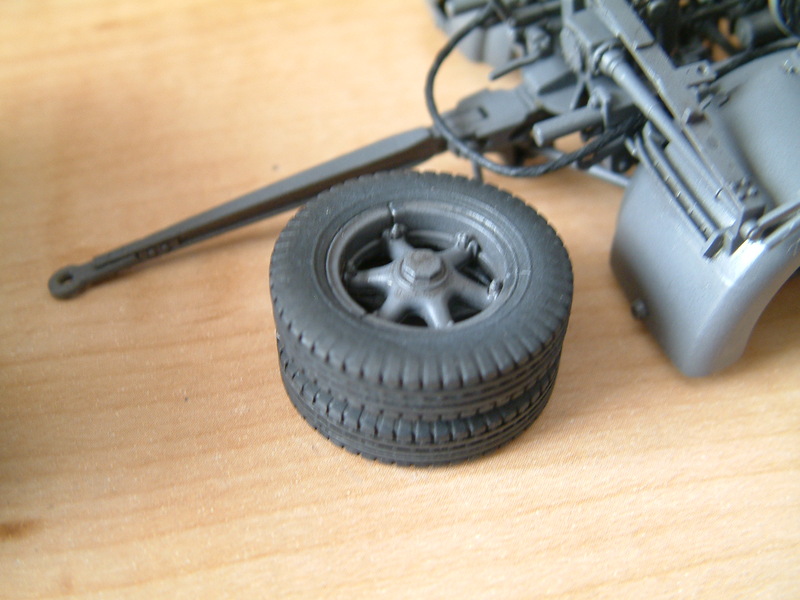 Simply fix the wheels to a toothpick using blue tac, and touch them to a paintbrush loaded with metallic paint, roll, and you’re done. The camo is almost finished. The mistakes were touched up using a paintbrush. The last step was to add the dots onto the tank… not very entertaining, but it’s done pretty quick. I sprayed a layer of Future Floorwax onto the model before applying any washes. The tank in it’s full glory after weathering… some washes, some drybrushing, and some pastel powder. For most of the time I’ve either used Gorilla Glue, or two part epoxy. I wanted to make sure the joints will hold. Forever. At least the bottom of the interior fit into the hull. Fitting everything together… with some paint already applied. The turret basket is -obviously- a multiple part affair… not an easy one at that. 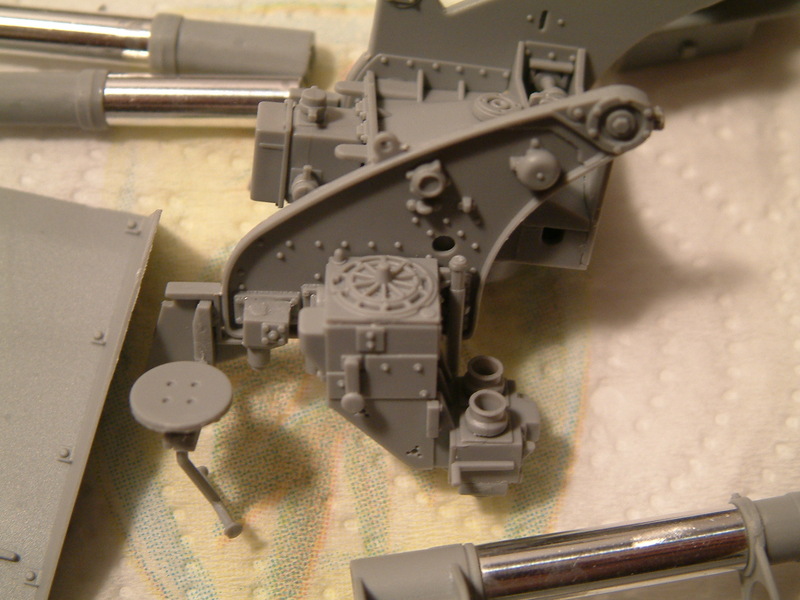 The detail is quite nice; you get all the motors that are rotating the turret, the gun cradle, equipment stored on the base of the turret. 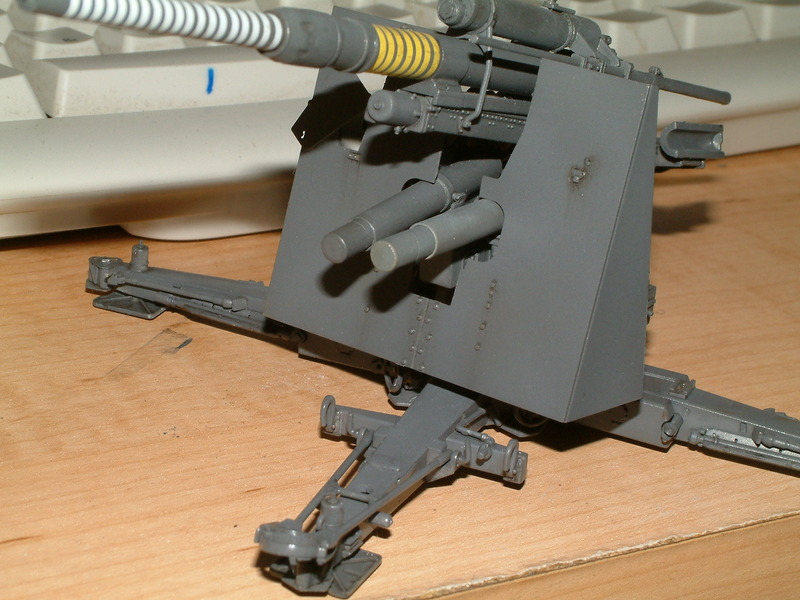 There’s even an ammunition pouch on the side. 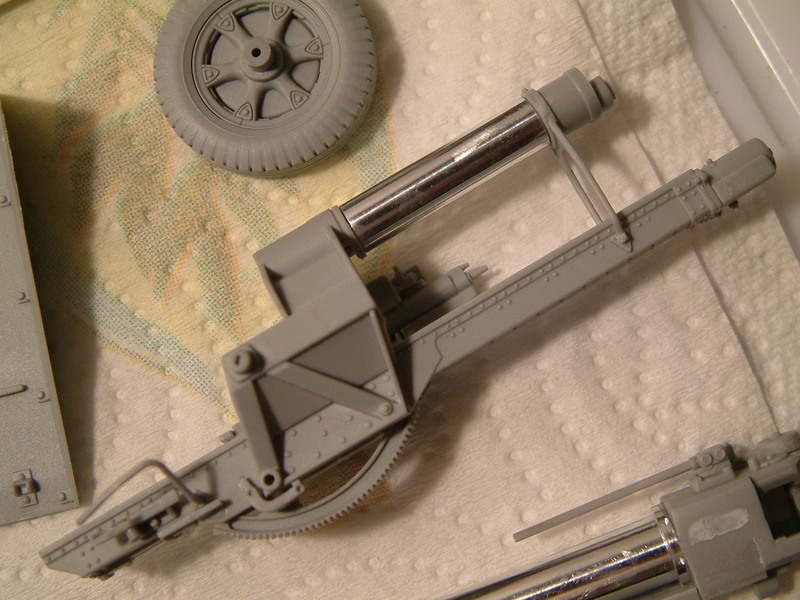 The gun’s breech is entirely resin; the kit did not have one. The turret basket is finished; with the seats installed it is quite apparent that even the relatively large Panther had a very tight turret. The assembled hull was sprayed with Surfacer 1000. Once the mistakes were corrected, I’ve used a light cream color for the typical German interior color. 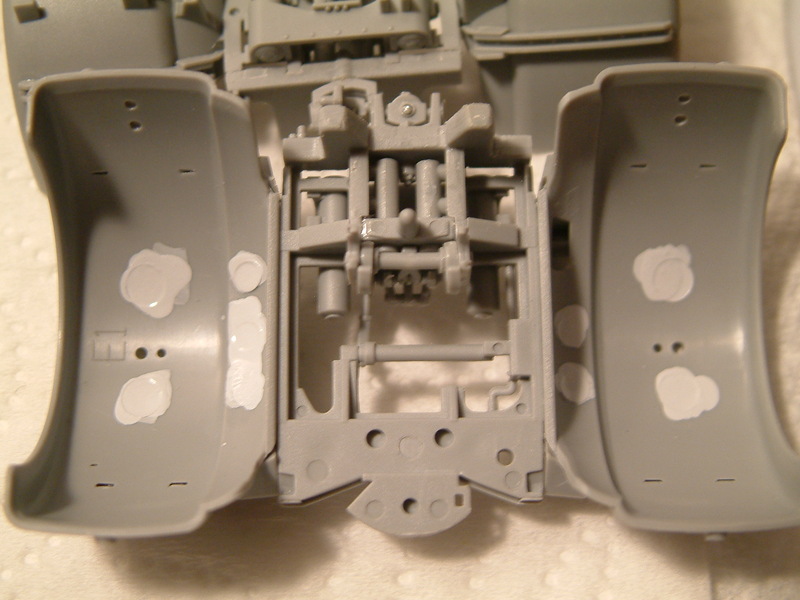 Once it was dry, the interior surfaces were masked with tape, because I needed to do the lower hull. I’ve decided against the typical primer red; every modeller uses it, but the Germans did not necessarily leave everything red. A lot of the tanks had a light blue-ish basecoat on the bottom of the inside. Kind of like this. I might sound a bit strange to do the blue second, but I was conscious of the fact that light colors are very difficult to paint well. I was not sure how hard it would be to achieve an even coat with the light cream over the darker blue. The neutral grey primer was a much more forgiving surface for painting it. Adding details… the tank’s interior looks more and more busy. I’ve collected some reference photos online; I tried to replicate the larger cables and wires, but overall I was not concerned with absolute authenticity. To be honest, as this was my very first resin interior, I was happy it was coming together nicely, and that I managed not to mess it up. Painting the turret was a similar affair: it was spray painted to the interior color, and I’ve used a brush to paint the rest. Weathering was done very lightly. Some metallic wear-and-tear only. Unfortunately I have not taken photos of the turret’s interior; Tank Workshop has provided everything to dress up the frankly quite plain kit turret interior. Even more details were added and painted. Finishing the interior by adding the ammo racks, radios, seats, and other small details. Painting the exterior was done after some extensive masking. I’ve chosen the two-tone color scheme from the box art. Camouflage was done with silly putty. The tank is unfinished as of yet. Mostly because it’s in storage still (I’ve built it in Florida), and because I have no idea how I should display it… I do not want to close up the hull. Perhaps I’ll cut a couple of holes on it, or display it somehow with the upper hull “levitating” over the lower. 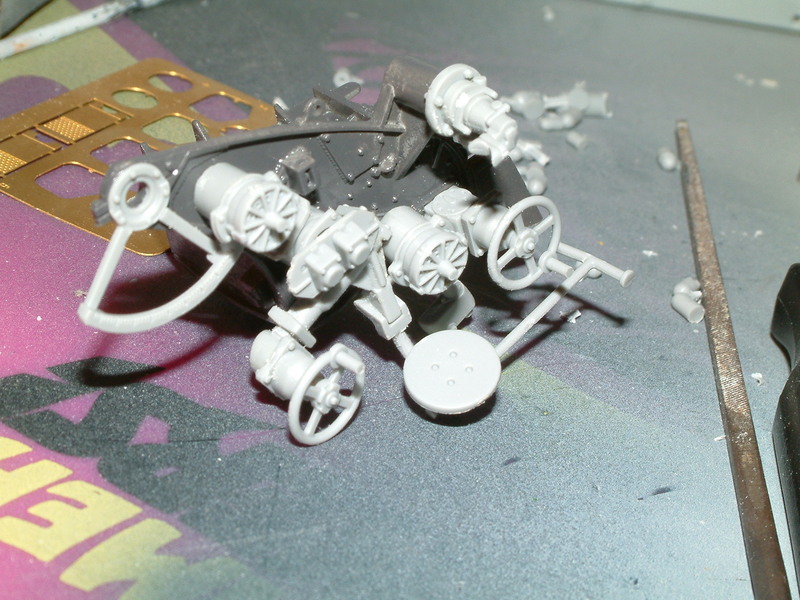 Some weathering will be also in order; the interior needs some scratches, some dirt; as does the exterior. Anyhow; the main parts are done. 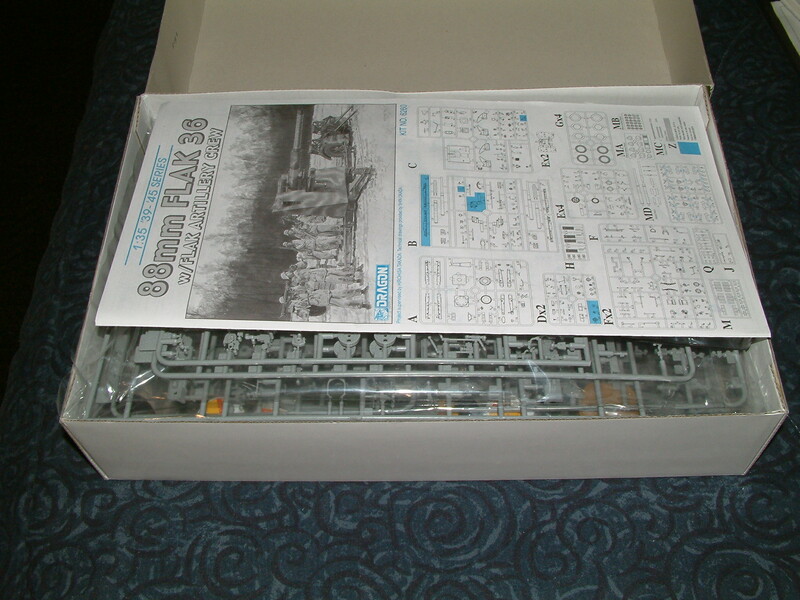 On to the next German tank with interior. This was my very first step into the world of armor modelling, back when this kit came out. So this was the first shot fired by DML, which was followed by their incredible Tiger series. You can’t help but admire the presentation.